We began using aAa® on our Holsteins in February 2005 with aAa® and Weeks® Approved Analyzer Tim Baumgartner, to give us another management tool in our breeding program. We feel aAa® use in our selection of sires have given us offspring that are improving every generation. We are happy with our young cows who have been the results of aAa® selection. These young cows are very balanced, functional and are developing into very good young cows. Also, now that more Brown Swiss sires are starting to have aAa® numbers, we are using them as well. It gives us another opportunity in looking at our cows – even an Excellent cow has a fault to improve on, and with aAa® we are seeing improved offspring, including the fall calf (pictured above) we successfully showed this summer. 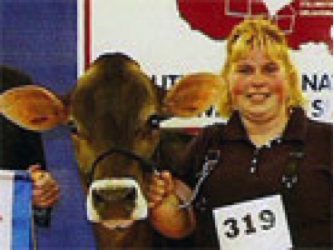 Having her win multiple championship ribbons and a top three finish at World Dairy Expo was thrilling. aAa® gave us another option when selecting a service sire and once again proves the value in complimentary, balanced matings. It’s fun and exciting to milk a group of cows that you can just see what the future holds for them.